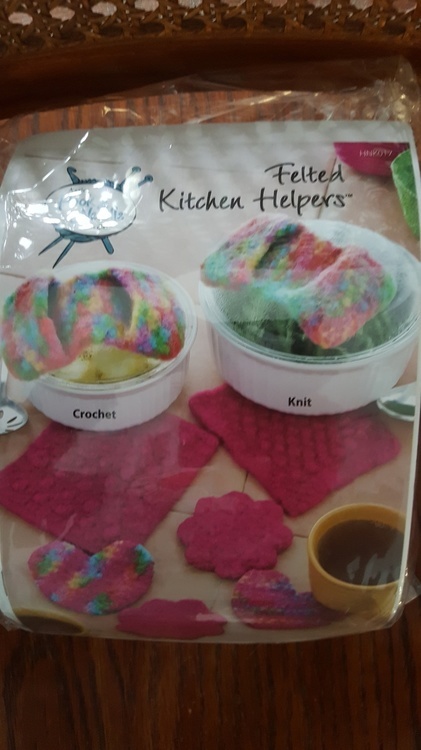 This is an Annie's Hook and Needle Club kit---Felted Kitchen Helpers. It includes the pattern to either crochet or knit a hot pad, a lid grabber and two coasters. plus two skeins of 100% wool yarn. If you are interested, please leave a comment on this thread and I will draw a name on Saturday. I've never felted anything either. If I remember correctly, somewhere among my WIPs is a purse that just needs to be put together and then felted. One of these days I'll hunt it up and finished it. This kit is yours, Lise. I'm sending a PM for the address.